Are you in the market to add a built-in grill to the patio or deck area of your home? Do you enjoy cooking with natural gas? 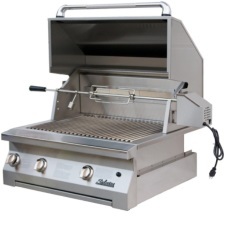 If so, then the Solaire 30-inch InfraVection Natural Gas Built-In Grill with Rotisserie Kit (model SOL-AGBQ-30VI-NG) constructed of stainless steel might be the option for you. The grill is created by the Solaire brand, considered the muscle car builder of gas grills. This version is both sleek and powerful with the Solaire Infrared Burner provided a so-called ‘rocket under the hood. With this burner, grillers can lock in high heat in order to see the juices stay in the meat to create a flavorful good that can ever be achieved with a conventional grill. Perfect for noncombustible built-in grilling islands, this Solaire item is ideal for natural gas grilling for your home for 2019. With this natural gas Solaire built-in grill, you have one infrared main burner and one convection burner. Each delivers 27,500 BTU per hour. Metal knobs are used for temperature control with an electronic ignition that is push-button with battery power gets the cooking going. A rear infrared rotisserie burner is included in this grill which has 14,000 BTU/hour. For your rotisserie needs, a spit rod is included with a heavy-duty motor for quality roasting capabilities. With the varying cooking capabilities, you have the option to move from steak to chicken or beef with ease. Learn which burners you like to cook on the most so that you can perfect your grilled meals. Additional features of the grill allow you to enjoy a quality cooking experience. A stainless-steel wire warming rack has been included and is large in size. Keep foods warm as you continue to grill during parties or get together. The double-skinned hood of the grill has a stay-cool handle, also of stainless-steel, that is easy to grasp and use no matter how long you have been using the grill or how hot the temperature. The firebox was welded fully within the seams to help control temperature needs. When it comes to reviews on the Solaire 30-Inch InfraVection Natural Gas Built-In Grill there are relatively few. Only one customer has rated the grill, but it did receive five out of five stars from Amazon and another person rated this grill a perfect 5 from another online retailer. One of the reviewers stated that the grill is beautifully crafted and gets HOT. He also felt that food tastes great from the grill. Even though the grill does not have many reviews, it is one created by the Solaire brand. For many grillers, the fact that the grill was created by Solaire might be enough to entice a purchase. Those who reviewed the product said … “Beautifully crafted” … “Solid grill” … “Food is delicious”. In conclusion, if you are in the market for a new built-in grill that is created by a reputable brand and offers maximum cooking potential, then the Solaire 30-Inch InfraVection Natural Gas Built-In Grill with Rotisserie Kit, Stainless Steel might be the right grill for you. The features offered to allow you to cook via a variety of burners including convection and infrared. With the rotisserie addition, you can include cooking a whole chicken or turkey to your menu. With the large grilling space, this natural gas grill allows you to cook as much as you like, whether you are hosting a party or simply making dinner for the family. The stainless steel welded construction ensures a quality product while the electronic push-button ignition is easy to use to fire up the grill when ready for cooking. The only drawback to purchasing the grill is the need for installation space as well as the price point. When adding the built-in grill to your home, space will be required for the installation. You may have to spend more initially to create a grilling area, but once completed, you will have a nice BBQ cooking space that you can share with family and friends. The price of the grill is also quite high so this may be something that you have to save up extra money for or consider it a splurge! Either way, after installing this 30-inch Solaire built-in natural gas grill, you are sure to be setting yourself up for massive amounts of outdoor grilling!